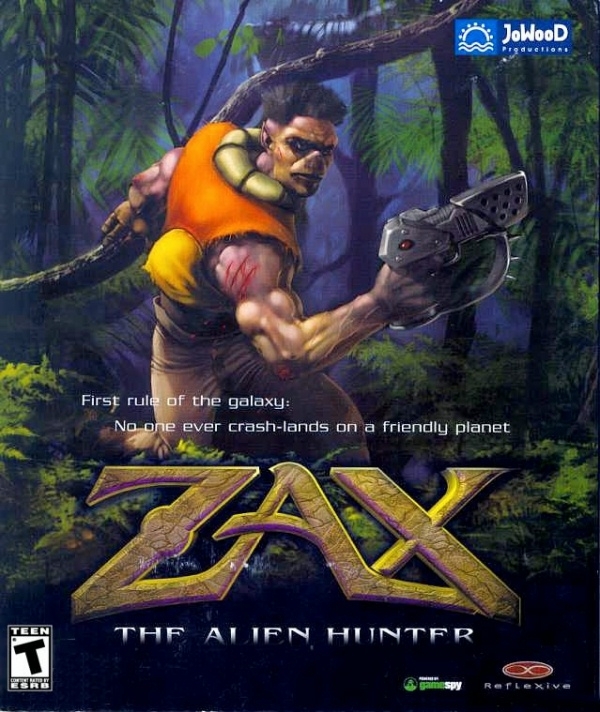 "Zax-The Alien Hunter" is a futuristic explorer. He travels alone. His sole, solitary mission: the acquisition of wealth. Or at least it was... because now Zax has crash-landed on an uncharted, hostile planet. With his ship suffering from rampant system failures due to the crash, Zax has no choice but to try and navigate this backwater world until he can acquire the necessary resources to repair his ship and escape with his life. With no military training, and only his wit and determination to sustain him, Zax relies heavily on the help of Zelon, his ship's artificial intelligence. Zelon serves as Zax's second set of eyes and ears and also supplies him with the items he needs to survive. He soon discovers that this is a place of ancient religion and wondrous magic. Here, he has but one potential ally - a downtrodden race that is desperate for help. These people, known as the Korbo, live in a primitive agrarian society and worship an angry god. - A powerful and terrifying god that walks among them. - A god that is very unhappy with Zax's presence.